Sacred Heart welcomed Mayor Al Heggins to our Morning Assembly. She wanted to recognize our students for the tremendous effort they have shown in serving others, raising money for charities, and lending a helping hand. She read a proclamation from the City of Salisbury to our middle school student government ...and then another one to our elementary student government...and all our students! Together our small hands make a BIG difference. This is who we are! One of the big lessons we teach is to "humble ourselves" and help those in need. Great job students! Thank you for inspiring all of us to be better neighbors. Congratulations to our Middle School and to our Elementary School who both won the Service Above Self County School Awards this year. Congratulations to Aidan Melton who was named the Elementary Student of the Year at the Rowan County Service Above Self Awards 2018. 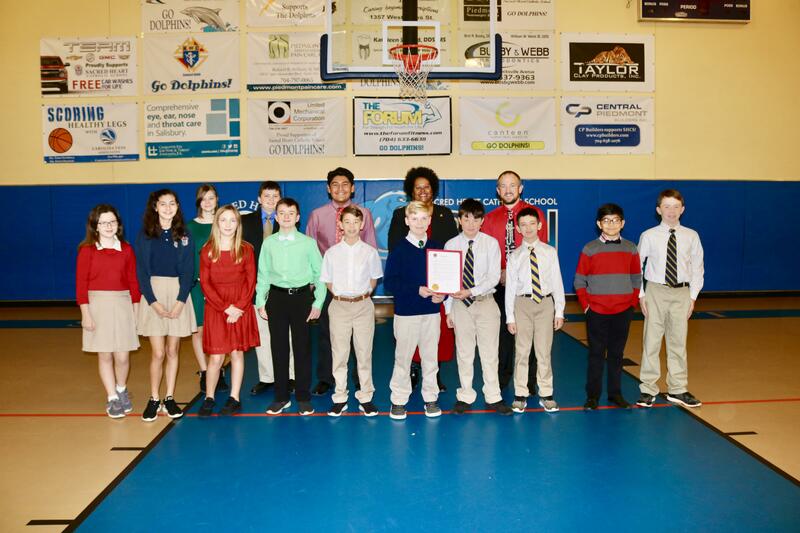 The 2018 Service Above Self awards were sponsored by RoCo United Way, the Rowan Rotary Club, Cheerwine, and Catawba College.